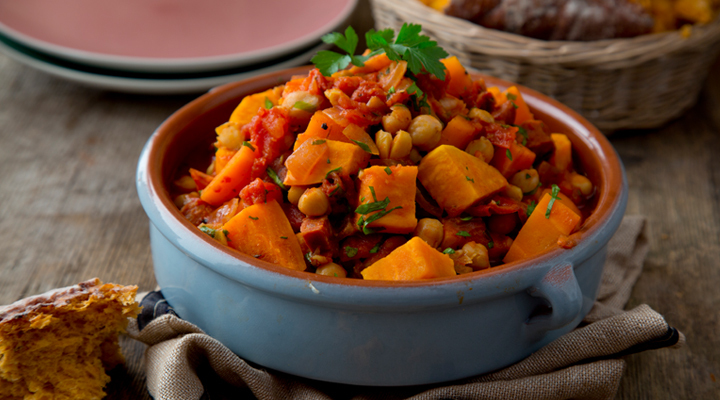 The chickpeas and sweet potato make you feel virtuously healthy, while the chorizo adds depth and spice. All in all, it’s an easy midweek meal for a cold night now that there are plenty more of those in store. 1. Heat the olive oil in a large pan set over a medium heat. Fry the chorizo for about 5 minutes, until it’s starting to brown and crisp up a little. Remove with a slotted spoon to a plate lined with kitchen paper and set aside. 2. Add the carrots, red peppers and onion and cook for about 5 minutes, until the onion has softened a bit. Add the garlic, smoked paprika and harissa and cook for 1 minute more. Add the chorizo back in, then stir in the sweet potatoes, chickpeas, tomatoes and chicken stock. Bring to the boil, then reduce the heat and simmer for 20 to 30 minutes, stirring now and then, until the sweet potatoes are cooked through and tender. 3. Ladle the stew into bowls with a dollop of yogurt and garnish with the fresh herbs. Serve with crusty bread to mop up every last bite.